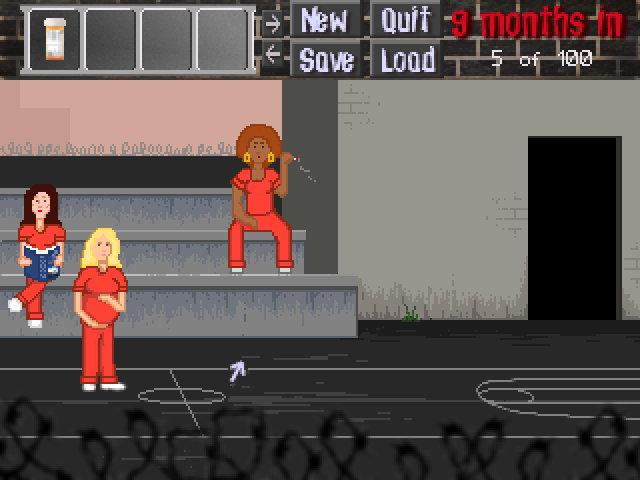 Back in March, I mentioned wanting to come back to 9 Months In, a point and click adventure game about a pregnant woman in prison who claims to be innocent. I finally got around to playing it again recently and enjoyed it. Despite some minor flaws, I think it’s worth the hour or so to complete it. It doesn’t hurt that it’s free. The protagonist claims to be innocent despite being convicted of attempted murder. She believes she was framed by someone because she made a lot of enemies working for the DA. When she finds her cellmate dead with signs pointing to her as the murderer, she investigates who could be setting her up. Let me cut to the chase and say that I found out you can double-click to skip animations. I didn’t know that but read it in a forum. That would probably make things go quicker. The voice-acting also highlights the fact that it’s an amateur game. That’s okay, but I found it the weakest aspect of the game. Anyways, I managed to get the end that hints at some interesting reveals, but with only 90 of 100 points, I didn’t earn the ending that actually revealed everything. I read some more information online that talked about the reveals – enough that I can infer it – but I didn’t actually find out exactly what was happening. Even when replaying the game, I didn’t get the 95 points needed. If you choose to play it and want to try for the best ending, here are a couple hints. Don’t read them if you don’t want any spoilers. Examine everything, and always tell the truth.